« Does salmon fishing have a future? I wrote this last summer and for some reason resisted publishing it on my web site, having re read it I decided that it merited an appearance. I had a recent trip to fish the Sesia River and one of its tributaries the Mastelone in the North West of Italy close to the Swiss border and adjacent to Monte Rosa which is the second highest mountain in the Alps. This is my second trip to the area as we went last year also at this time. How conditions can alter in a year last year was warm with bags of sunshine whereas this year it was wet and grey. The river heights also varied at this time and this year they were clear but up maybe 6 inches on last year. 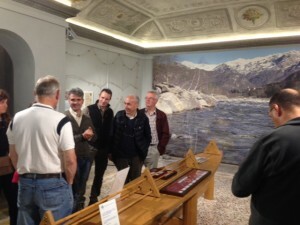 Perhaps the most interesting experience was fishing the Sermenza a mountain torrent which contained brown trout and rainbows apparently up to a couple of kilos in weight, yes correct a couple of kilos. It was the ultimate pocket water and very difficult to fish with my 9 foot 5 weight as it was difficult to hold a fly before drag set in. 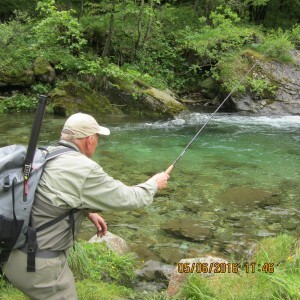 So I opted to fish with a Tenkara outfit as I had done in the autumn of 2015 when I fished the Sarca’s tributaries similar mountain torrents in the North East of Italy in the Dolomites. Valsesiana is not unlike the Tenkara style of fishing and is fished with a stiff rod of approximately 4 metres in length. These days for ease of transport a telescopic carbon fibre pole is used originally it was manufactured from a reed cut in the Po valley. The line is handmade, spun from stallion’s tail fibres, tapered and finished off with a tippet of usually 3 spider style flies or less. The rod is much stiffer than Tenkera and much more able to hold a fish in these mountain torrents. 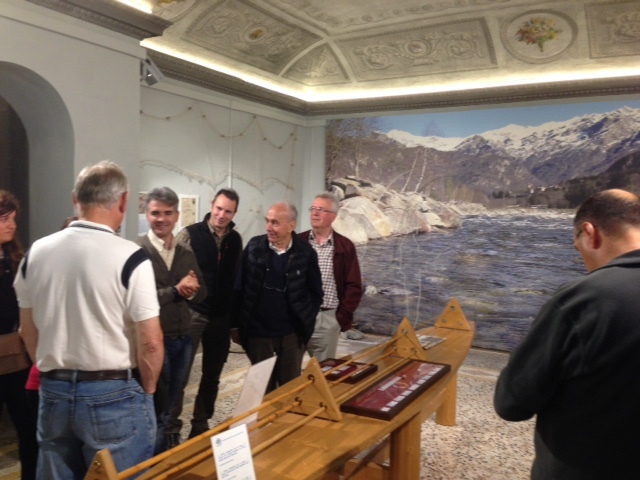 There is a museum dedicated to Valsesiana style in the town of Varallo I have been there twice now and had hosted visits in the company of Andrea Scalvini a leading light for the Valsesiana style and manufacturer of rods and horse hair leaders. If you get the opportunity I would encourage you to go. 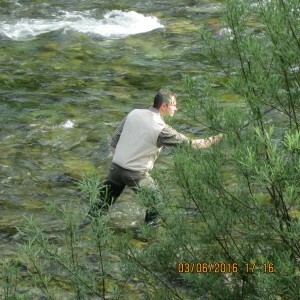 So how far did I get with my Tenkara rod I have to confess not far, my very first cast proved how impossible it was to us in these streams with the size of fish. I had on a comparadun and as soon as it hit the water up came a good brown, probably at least a couple of pounds. The next few seconds proved how this rod was only up to coping with smaller fish. The trout took off into the current and there was absolutely nothing that I could do to hold it and certainly not move it. It came unstuck when it went down behind some rocks mid-stream. 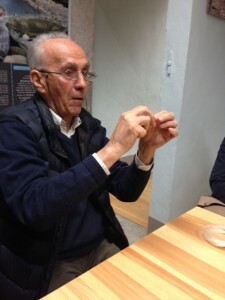 Sadly all of this was being observed by a couple of Italians my friend Pino Messino and the guru himself Andrea. Rather than fish on with the Tenkara I took Andrea’s advice and switched to one of his Valsesiana rods for the rest of the afternoon. I do not believe that you can fish dry fly as we know it Valsesiana style using the horse hair line. The line is heavier than a furled leader especially as it is knotted every foot or so. It therefore sags and a belly is formed, the belly is inclined to cause the dry fly to drag. 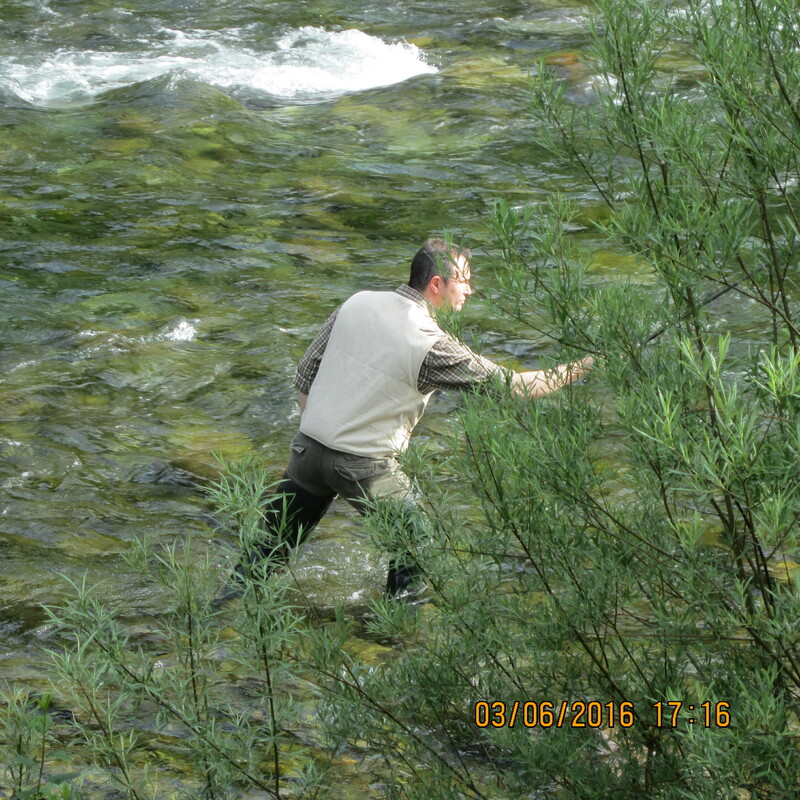 With Tenkara a fluorocarbon leader would not be so inclined to do this. It is however perfect for spider fishing. These spiders are very similar to North Country spiders and the ones that I was offered were similar to a partridge and orange, and others with a purple body, I hesitate to say snipe and purple as the hackles were not snipe. They are fished upstream and across and the plan is to fish the “bob” and keep the top fly just on the surface in this way the other two flies are kept just below and represent emergers and nymphs. Did it work? Without a doubt, yes it did and I spent the rest of the afternoon in the pouring rain catching fish from difficult to fish pocket water. Would the style have an application in the UK? Where I fish it would, in the larger Scottish rivers where we are likely to catch bigger fish and here I am thinking about the Clyde, Tay, Tummel and Tweed. Finally when using the very traditional style of reed pole, and horsehair leader Andrea rightly pointed out they manufacture all their own requirements and a horse hair line can last up to 30 years if damaged they simply replace the damaged section. There is also a simplicity to the style and the tackle was very minimalist just pole, line and wallet of flies and materials. This entry was posted on Tuesday, February 7th, 2017 at 4:18 pm	and is filed under Uncategorized. You can follow any responses to this entry through the RSS 2.0 feed. You can leave a response, or trackback from your own site.